BX-4 Handheld Refractometers are exceptionally simple to operate and provide quick, accurate measurements of aqueous solutions. High Range Refractometer, for honey, sorghum, maple syrup, etc. The BX4 is a High Range Refractometer, for honey, sorghum, maple syrup, etc. Range 45 - 82 Brix %. 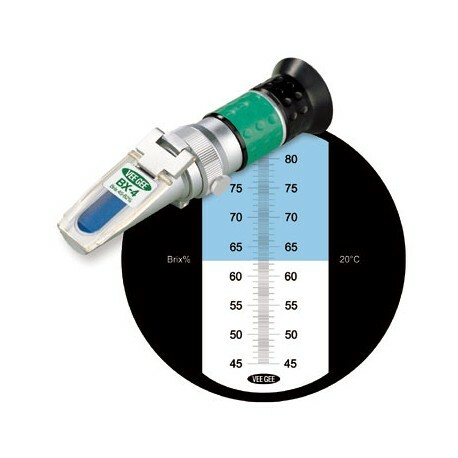 This Brix Refractometer has the Largest and Sharpest Display Scale Available. Every X-Series Brix Refractometer features the largest, easiest-to-read scale available with clear, sharp figures, screen shading, and incredible contrast. These features significantly enhance overall accuracy... even when the instrument is used by several different operators. All units feature rubber grips on the body, which block the transmission of hand heat to reduce temperature errors. The small size (roughly 1-1/2" x 1-1/2" x 5-1/2") of the X-Series models allows them to be used anywhere... the field, plant, or lab. Features rugged construction to provide years of reliable use. The optical glass prism is mounted in an all-metal housing which allows the sample and prism to reach temperature equilibrium quickly. Non-roll stand keeps instrument from accidentally rolling off table or benchtop. 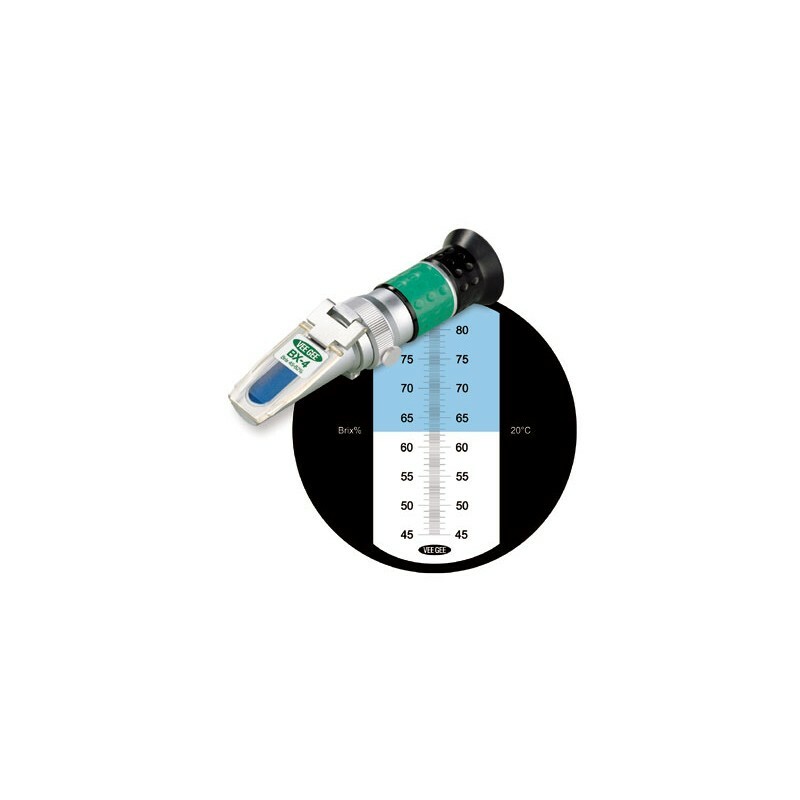 The exclusive "Zero Ring" eliminates the hassle of using a separate tool for calibration. Simply place a few drops of liquid standard (for example, distilled water) on the prism, turn the built-in "Zero Ring" until the shadowline is at the correct value of the liquid, and secure the set screw...that's it!